Civic, Religious and Community Leaders and Guests assembled in discussion around topic Eradication of Acts of Religious Discrimination. HCWPRLM’s 34th WARP Office in conjunction with the UN World Interfaith Harmony Week, celebrating together with special performance by International Peace Youth Group (IPYG). Founded in 2012, HWPL is a not-for-profit, non-governmental organisation registered under the Korean Ministry of Foreign Affairs and is recognised as an international peace organisation in association with the United Nations Department of Public Information (UN DPI). 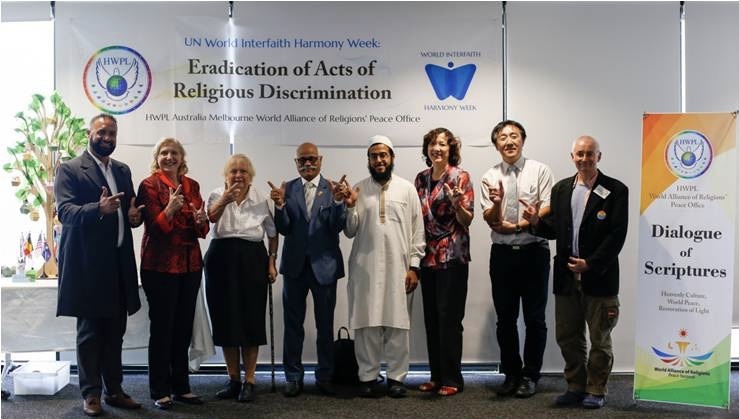 WARP Office promotes harmony not just to the religious community but to the wider local communities. 1) How religious discrimination happened to you? 2) How did it affect the life of people/you? 3) What can we do to improve? Testimonies of past experiences of Religious Discrimination by members of Islam, Zoroastrian and Presbyterian communities. The Islam representative talked of the present day rise of Islamaphobia in Australia and recounted difficulties experienced from being identified publicly by elected political leaders as a group causing all presenting problems. The Zoroastrian representative spoke of original persecution causing them to flee homeland (Persia) in 7th Century. Landing and being warmly welcomed temporarily by India who then needed a little convincing to let them stay. Ancestor refugees promised not to be a burden and to “be the sugar in the Indian milk” to assuage their Indian hosts that they were worthy of permanent residency. The Presbyterian representative discussed how his Buddhist grandparents, primary carers for him and his sister, wouldn’t allow them to touch items on the home shrine and forbade them from going to Sunday School, locking them in their rooms to prevent a repeat. Square Table discussions followed with the speakers, invited responses from Jewish, Catholic, Buddhist and Hindu representatives and audience members. Sharing hope and willingness to seize negative attitude through peace events, talking about experiences in any discrimination and participating in calls to stop acts of religious discrimination. Then the talking stopped for an inspiring presentation by the International Peace Youth Group (IPYG). Individuals dressed to represent major religions, each holding “The Key”. Told through mostly non-verbal play, Key Holders fought over the right to unlock secrets and reveal “The Sacred Teaching”. Discrimination is unlimited and takes many forms. It was interesting to hear how the 3 questions posed could, were and are interpreted so differently. Some spoke from the position of being discriminated against now because of their religious identity. Others spoke of being discriminated against by their own religion because of their identity (ie, naturally born characteristics such as ethnicity, caste, gender, sexuality). Another spoke of being part of the Australian colonial group that has caused most of the discrimination. Some discriminations were ancient historical, some were in living memory and some ongoing and increasing in the present day. The more experienced migrant groups spoke of taking self-responsibility for adopting, mixing or reconciling with the host culture, learning what the rules were, getting along well with others and adding value to community. Compromising personal/familial/religious identity was discussed relative merits by migrants to/not change names to make things easier (making friends, increasing opportunities in job markets, increased visibility of assimilating). The Buddhist view was expressed that Suffering is perceived, created and caused by an Unawakened mind. The root cause of these Sufferings being Ignorance, divided into the 3 Confusions. Overwhelmed (Too much information, so we’re frozen to the spot), False View (100% energy being put into a 1% Truth, ignoring or denying the other 99% existences) and Apathy (thinking that surrounding negative behaviours “I” don’t directly experience aren’t affecting “me”). Transformation arises when antidotes of identifying correctly the suffering, application of the time-tested antidotes of Wisdom, Compassion and Generous-heart. A Catholic working in mental health and interfaith space in Victoria, expressed the root cause of Discrimination as an absence of Love: of self, of other and of God.